Thallus: placodioid, 1.5-3.5 cm wide, c. 1 mm thick in center; often forming neat rosettes; prothallus: absent or vestigial and black areoles: irregular in outline, often crenate-incised, sometimes partly lobe-like, sometimes subdivided into secondary areoles or lobules, 0.5-1.5 mm wide lobes: thin to thick, plane to convex, tightly to loosely attached, 1.5-3 mm long, 0.3-1 mm wide, scarcely to strongly dissected, the ultimate segments 0.2-0.5 mm wide upper surface: ranging from various shades of red to yellow or olivaceous brown to (especially in our area, and in shaded (foggy habitats northward) pale gray, yellow or white, dull to shiny; edges: concolorous or blackened; tips: very shiny, light olive-brown to dark yellow, esorediate upper cortex: with dead algal cells, 25-45 µm thick, inspersed with brownish granules (soluble in K); epinecral layer: 0-10 µm thick medulla: dense, at least in central layer with grayish granules (insoluble in K); hyphae: 2-5 µm in diam. ; algal layer: continuous, or interrupted by narrow columns of hyphae, 35-70 µm thick lower surface: pale brown to greenish black lower cortex: usually vestigial, extending from the blackened edges of the lobe tips, clearly delimited from the medulla Apothecia: often few or lacking, or immature, but occasionally common, borne submarginally on areoles, adnate to sessile, +constricted at base, 0.5-1.5(-2) mm in diam. disc: pale to moderate or occasionally dark reddish to yellowish brown, plane or soon convex; +shiny margin: concolorous with thallus or sometimes blackened towards outside, +raised when young, c. 0.1 mm wide, entire to flexuous or crenate, narrowing, finally excluded, sometimes with a visible, dark grayish olive to dark bluish gray parathecial ring, N+ red-violet amphithecium: present, with a continuous algal layer (30-75 µm thick) in upper part of margin next to hymenium and extending below hypothecium, with an indistinct medulla without granules, corticate; cortex: similar to that of thallus, 30-40 µm thick parathecium: hyaline, usually indistinct, with thick-walled hyphae c. 5 µm in diam. and with 1 µm wide lumina, up to 25 µm thick epihymenium: densely inspersed with fine granules (soluble in K), 10-25 µm thick hymenium: hyaline, 55-70 µm; paraphyses: hyaline, distinct and rather loosely coherent; tips: scarcely thickened, 2-3 µm wide; subhymenium: yellow-gray, indistinctly delimited, 35-40(-60) µm thick, with oil droplets; hypothecium: pale yellow, 30-50 µm thick asci: clavate, 8-spored ascospores: hyaline, simple, ellipsoid to usually broadly ellipsoid to ovoid, (7-)913(-14) x 4-7(-8) µm Pycnidia: sometimes common and conspicuous; ostiole: reddish or deep brown or blackish brown; conidiophores: type III of Vobis (1980) conidia: filiform, (15-)20-30(-40) µm long Spot tests: thallus K-, KC-, C-, P- Secondary metabolites: cortex usually with isousnic acid (major to trace), sometimes also placodiolic acid, and unknown brownish pigment (not detectable by TLC); medulla usually with rangiformic acid (major), or in var. protolichesterinica protolichesterinic acid chemosyndrome; various depsidones (hypoprotocetraric, etc.) and unknowns occurring sporadically; sometimes no substances detectable in TLC; norstictic acid from Aspicilia spp. is a frequent contaminant. Substrate and ecology: in shaded to open areas on non-calcareous rocks (especially granite or volcanic rocks), outcrops and on projecting angles of the rock; usually in foothill oak-pine woodlands, very frequently overgrowing and perhaps initially parasitic on Aspicilia spp. World distribution: throughout California and once in NW Mexico Sonoran distribution: southern California, 6002000 m and Baja California (Guadalupe Island). 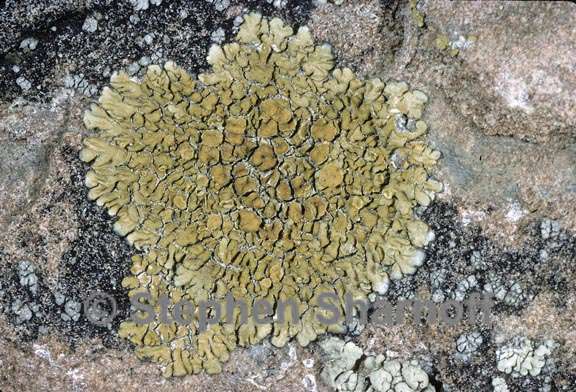 Notes: In the Sonoran area Lecanora mellea is likely to be confused only with L. pseudomellea, which differs in having a true cortex and somewhat inflated and plicate lobes as in L. garovaglii. Most material of L. mellea from the Sonoran region is of the typical chemotype, with rangiformic acid, +isousnic acid; this chemotype is quite variable in morphology, but frequently has rather thick, loosely adnate thalli and coarse, weakly dissected, convex lobes. One specimen in our area (Riverside Co.) contains fatty acids of the protoconstipatic group +isousnic acid; material of this chemotype, which is more common in towards the north , has a thin, tightly attached thallus with the lobes plane, narrow, and +strongly dissected, often subpinnately and upper surface mostly pale to moderate yellow or orangish yellow, often mottled or edged with black, and may represent a distinct taxon. However, some collections of the rangiformic acid chemotype also have this morphology and coloration. The taxon described as L. collatolica Thomson and T.H. Nash (with usnic placodiolic acids only, a thick yellow-green thallus, abundant apothecia with deep red-brown discs and prominent thalline margin, and broadly ellipsoid spores) is still known in its pure form only from the type collection (from just outside the Sonoran region), but many specimens, including one from our region (Los Angeles Co.) are intermediate between it and typical L. mellea, in appearance, chemistry, and spore shape, suggesting introgressive hybridization of the rare L. collatolica into populations of the very common L. mellea.